Four-time Olympic gold medalist Simone Biles made her Dancing with the Stars debut last night and is already emerging as a frontrunner for the Mirrorball Trophy. As Biles and partner Sasha Farber tangoed their way to the highest score of the night (a 32/40 for DWTS loyalists), they had some serious star power there for support. 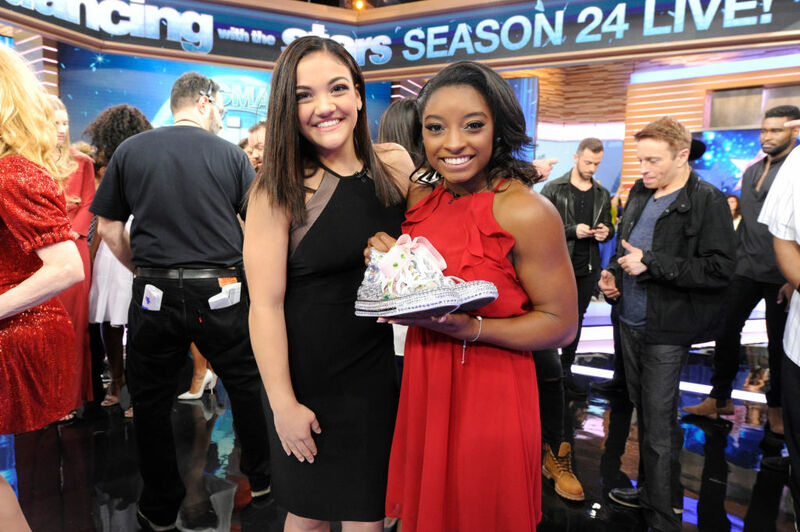 Fellow Olympic champion and DWTS alum Laurie Hernandez was there cheering Biles on from the audience. As the reigning DWTS champ we’re thinking Hernandez gave her Final Five teammate a few pointers ahead of her debut. Biles told People magazine after the show that Hernandez texted her to wish her luck ahead of the premiere. Having Hernandez’s support doesn’t mean she isn’t nervous about the competition though (historically, gymnasts appearing on DWTS have found a lot of success on the show — something not lost on Biles). “I try not to think about it but it is a lot of pressure because all of the gymnasts have done really well, but I just try to be myself,” Biles said. With the pressure for dancing success off her, Hernandez looked like she was having the time of her life from the sidelines, photobombing host Tom Bergeron at every opportunity. She also snapped selfies with fellow DWTS season 23 competitor Terra Jole, who sat alongside her. While she may be keeping her fingers crossed for Biles, Hernandez took to Twitter to congratulate all the competitors on a fantastic debut. We hope Hernandez continues to light up the DWTS audience and hopefully we’ll see other members of the Final Five come cheer on their teammate!